The Pakistani government is looking for new ways to censor the Internet. 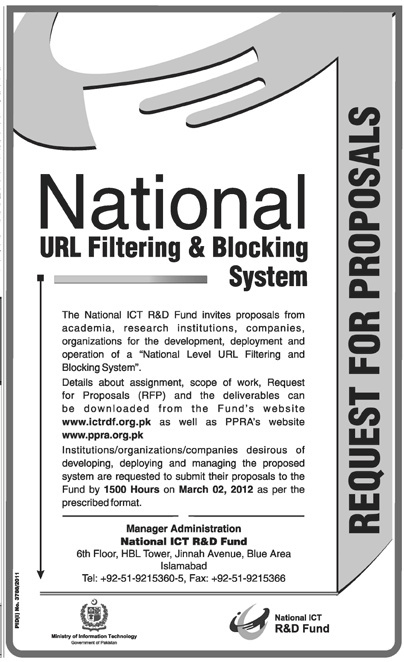 This week, the Pakistani Telecommunication Authority (PTA) released a Request for Proposals (RFP) for the development, deployment and operation of a “National Level URL Filtering and Blocking System,” calling on institutions to submit by March 2nd a feasible proposal that would allow the government to institute a large-scale filtering system. Shockingly, the RFP requires: “Each [filtering] box should be able to handle a block list of up to 50 million URLs (concurrent unidirectional filtering capacity) with processing delay of not more than 1 milliseconds.” While content filtering and blocking has existed in Pakistan for the past few years, it has been executed manually and has thus been inconsistent and intermittent.1 The state’s latest effort to subsidize a comprehensive, automated censorship regime is deeply troubling. Many countries have deployed web filtering and blocking systems at the Internet backbones within their countries. However, Pakistani ISPs and backbone providers have expressed their inability to block millions of undesirable web sites using current manual blocking systems. This system would be indigenously developed within Pakistan and deployed at IP backbones in major cities, i.e., Karachi, Lahore and Islamabad. Any other city/POP could be added in future. The system is proposed to be centrally managed by a small and efficient team stationed at POPs of backbone providers. The system would have a central database of undesirable URLs that would be loaded on the distributed hardware boxes at each POP and updated on daily basis. The database would be regularly updated through subscription to an international reputed company maintaining and updating such databases. The RFP ends with 35 system requirements that details all aspects of the project and what would be required in the system. Some other specifications for the system include capabilities to block both an individual and a range of IP addresses, have support for multiple languages, and be stand-alone hardware that can easily be integrated into any network. The entity funding this initiative is an arm of the Pakistani Ministry of Information Technology called the National ICT R&D Fund. The Ministry created the fund in 2007 to take a certain percentage of revenue from telecommunications companies and allocate it for scholarships in IT education and research and development of information and communication technologies. Therefore, all grant funding for this national censorship project comes from domestic ISPs, mobile carriers, and telephone companies. The decision-making process by which it chooses projects and beneficiaries for grants, however, is not described anywhere on their website. Censorship and content filtering is part of a broader trend towards moral policing in Pakistan. Ever since the Pakistan Telecommunication Act, passed in 1996, enacted a prohibition on people from transmitting messages that are “false‚ fabricated‚ indecent or obscene,” the PTA has increasingly intensified their efforts to censor content online. The PTA blocked thousands of sites in 2007—not just those containing pornographic material or content offensive to Islam, but numerous vital websites and services—in response to a Supreme Court ruling that ordered the blocking of “blasphemous” websites. In 2008, they briefly blocked YouTube because the site hosted Geert Wilder’s film “Fitna.” They blocked it again in 2010, over a hosted clip of Pakistani President Asif Ali Zardari telling an unruly audience member to “shut up.” In May of 2010, the PTA blocked Facebook in response to a controversy over a competition to draw the Prophet Mohammed. Most recently in November of last year, the PTA sent a notice to Pakistani mobile carriers to ban 1,600 terms and phrases from SMS texts within seven days or they would face legal penalties. It was soon revealed that the list originated from an American National Football League’s “naughty words” list words that were banned from being printing on American football jerseys. This new proposal is fundamentally different from Pakistan’s prior censorship efforts. First, it aims to find a non-governmental third party to design and implement a censorship mechanism. Second, this new system would, for the first time, automate the blocking and filtering process to facilitate comprehensive censorship of webpages. Previously, they have had to censor and block content manually and therefore the process has been less than consistent. Bytes for All, Pakistan (B4A), strongly condemns this move of the Government and holds it akin to infringing citizens’ fundamental constitutional rights. For a democratically elected civilian government, implementing such a system is highly dictatorial in nature and will directly affect the freedoms and socio-economic well-being of the citizens, reflecting the tyrannical actions of repeated oppression by past military governments. We feel that for successful implementation of a policy at all levels, transparency is crucial. We are a functioning democracy and therefore it is important to have stakeholders on board that could guide and assist on a policy before such a decision is made. The website for the National ICT R&D Fund states that its mission is “To transform Pakistan’s economy into a knowledge based economy by promoting efficient, sustainable and effective ICT initiatives through synergic development of industrial and academic resources.” For the past five years, the fund has backed domestic IT projects in education, health, and technology development, including some dubious projects in biometrics and other supposed security measures. It is deeply ironic that the National ICT R&D Fund’s purported purpose is “to transform Pakistan’s economy into a knowledge based economy,” yet it calls for proposals for a project that is itself inherently backward and draconian. A national blocking and filtering system would thrust the entire society into a tailspin of repression that would do immeasurable damage to the economy. More importantly, this automated censorship regime would violate the human right to free expression and access to knowledge. It’s clear that the authorities behind these institutions simply do not comprehend the massive socio-economic costs this would have on Pakistan. As Bolo Bhi wrote in their press statement: “At a time when we as a country are struggling to counter a popular narrative about us, further limiting the sphere would portray us as a grim totalitarian state, which is simply untrue.” If the government of Pakistan ever hopes to catch up as a hub of innovation and re-emerge into the international realm as a modern democratic nation, a repressive censorship program restraining Pakistani expression would not be the place to begin.